This Wednesday, February 14th, Redemption Hill will be observing Ash Wednesday together. Ash Wednesday is the first day of Lent, and the season of Lent is a time to prepare for the celebration of our redemption and renewal through the life, death, and resurrection of Jesus Christ. Lent invites us to make our hearts ready for remembering Jesus’ passion and celebrating Jesus’ resurrection on Easter. We are doing an Ash Wednesday service for a few reasons. First, we want to reflect on our sin and the resultant death that reigns in us, and our need for Jesus to save us. Second, we want to renew our commitment to daily repentance — to “die daily,” as Paul said in 1 Corinthians 15:31. Lastly, we want to remember and celebrate the fact that Christ conquered sin and death. So why is it called “Ash” Wednesday? And why do Christians put ashes on their heads? Ashes are a reminder, in Scripture, of our mortality and frailty resulting from the curse of the Fall (Genesis 3:19; 18:27). The Bible also uses ashes as a sign of sorrow and repentance for sin (2 Samuel 13:19; Esther 4:1-3; Jeremiah 6:26). They are also a sign of both our mortality, and of our intention to die to old ways and live a new life in Christ. Putting ashes on your forehead in the sign of the cross is not some kind of magic charm. It is simply a visible reminder of our condition and the power of the cross to forever change that condition. Stricken, Smitten, and Afflicted by Thomas Kelly. 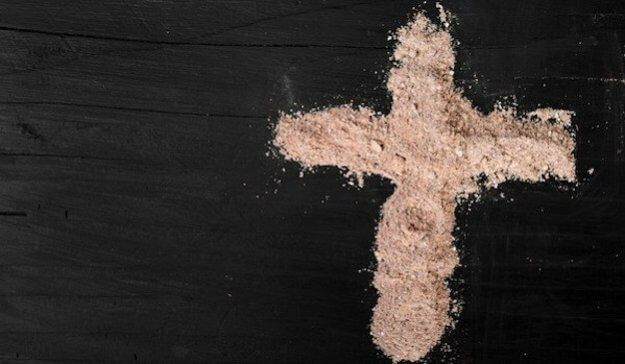 Our Ash Wednesday service will be Wednesday afternoon, February 14th, from 12:00 to 1:00 p.m., at The Fourhundred. If you are planning on attending, please RSVP here and share the event with your friends, family, and neighbors. No childcare will be provided. Make plans now to join us over the lunch hour as we begin this holy season together by acknowledging our need for repentance, and our need for the love and forgiveness shown to us in Jesus Christ.